Present state: The down platform is extant along with the station building which is now a private residence. The up platform is also still extant although partially soil covered and heavily overgrown so it's difficult to see anything. Notes: Brookland Station is between the villages of Brookland and Brenzett. 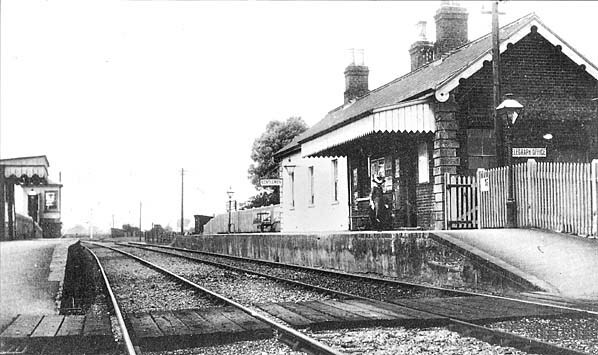 Traffic was always light and although the station was originally provided with two platforms the passing loop and the down platform, which included the main station building, were taken out of use in 1921 when the signal box was closed. Although there were proposals to build a horse dock siding off the passing loop, this was never built and the station never carried any freight traffic. Brookland was downgraded to 'halt' status and all the facilities were concentrated on the up platform which was provided with a waiting shelter. 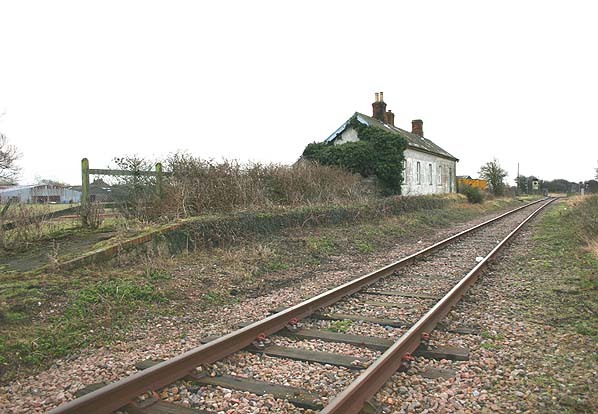 The level crossing was controlled from a small ground frame hut with a resident signal-porter who also sold tickets to the occasional traveler. This was eventually replaced with a new ticket office alongside the road. As the photographs show, very little has changed at Brookland in the last 30 years. on 4 July 1937. At the same time the station at Lydd was renamed Lydd Town and passenger services to Dungeness was withdrawn, although the freight service was retained. In the early 1960's the line received a new use with the opening of Dungeness Nuclear Power Station in 1965. The passenger service was improved with steam being replaced by two-car diesel-electrics providing 11 trains a day in 1962; with most running through to Ashford. This new prosperity was not to last however and both the Ashford - Hastings line and with it the New Romney branch were proposed for closure in the 1963 Beeching Report. The goods services to New Romney was withdrawn in 1964 but the threat of closure was suspended until 1966 when the Minister of Transport announced that the passenger service on the New Romney branch would cease on 6th March 1967. The Ashford - Hastings line was however reprieved although some sections were eventually singled.